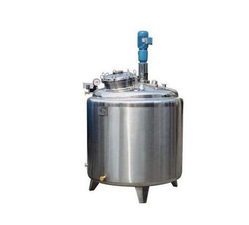 We are one of the leading fabricator of a comprehensive range of Reactor Vessels that is catered to numerous application areas in chemical, steel units, automobile sector and many more It is available with agitators and is manufactured in cylindrical shape with vertical mounting facility. Its tops are open with flat and conical lids and bottoms are flat and conical shapes. We offer this with complete assembly along with stuffing box, agitator, gear box and motor with base frame. Also, our company provides cooling coil arrangement as per the customer’s requirements. Being a client centric firm, we are involved in providing Tilting Mixing Kettle. Moreover, experts check these products on diverse quality norms in order to deliver a defect free range. Having a definite quality managements system in the market, we are engaged in offering best and excellent quality assortment of Mixing Kettle. It has wide range of kettles & pans for boiling, braising & frying. We are a renowned name in the industry to provide our precious patrons with a qualitative range of Mixing Kettle. This steam kettle is manufactured using superior quality raw materials and advanced technology under the meticulous supervision of our veteran team of professionals in tandem with the international quality standards. Widely demanded in chemical, pharmaceutical and food processing industry, clients can avail this steam kettle from us in various technical specifications at pocket friendly price.